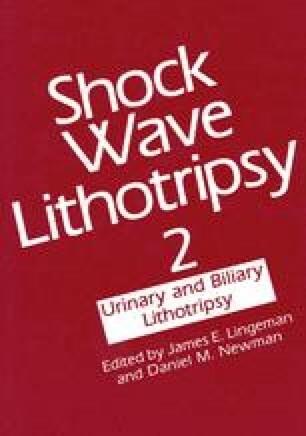 Twenty-one gallstones were fractured by shock wave lithotripsy in vitro to study the effect of calcification on fragmentation and to assess the use of sonography for the evaluation of fragment size. Roentgenograms were made of 21 surgically removed gallstones, ranging from 9 mm to 13 mm in diameter, which had been placed in a water bath. The amount and extent of calcification were determined by study of the radiographs. Then the stones were placed into a water-filled condom, lowered into a water bath under ultrasound guidance, and fractured by a commercially available shock wave gallstone lithotripsy device. All stones required from one to 42 shock waves (SW) for initial fragmentation and from six to 888 SW for complete fragmentation (using ultrasound imaging, all fragments estimated to be < 5 mm). Stones with a calcified rim required an average of three times as many SW (P < .05) as non-calcified stones for initial fracture, but no significant difference in number of SW was required for complete fragmentation (median 61 SW v 64 SW). Seven observers, six radiologists, and one radiology resident attempted to determine from post-lithotripsy sonograms the largest fragment size in the presence of multiple fragments in 14 of the fragmented stones. Thirteen of the stones had an actual largest fragment size larger than 5 mm in diameter, however, there was no correlation (r = .15) between actual fragment size and the assessment of fragment size by the observers. In particular convexoconcave-shaped fragments caused difficulty for observers in estimating fragment size in the presence of multiple fragments, because the ultrasound image of the fractured face of the stone may appear to be multiple smaller fragments. Therefore, it can be concluded that sonography tends to underestimate the fragment size during lithotripsy, and for complete fragment evaluation, multiple views of the fragments should be obtained by changing the position of the patient.